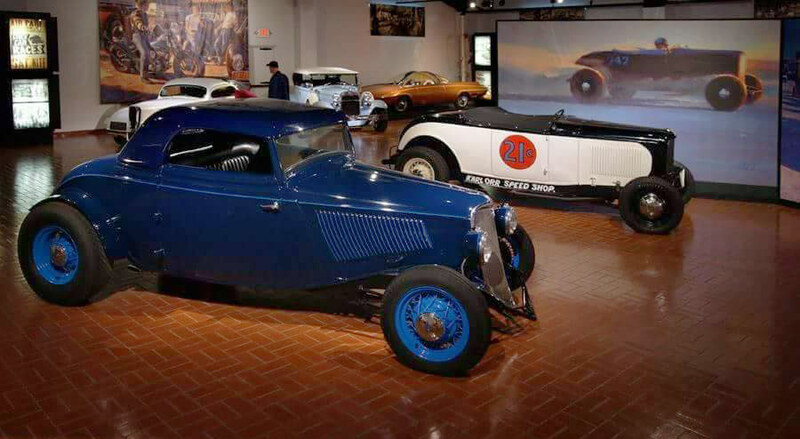 Thom Metz has created a 1933 Ford Cabriolet Hot Rod influenced by it original Hot Rod heritage and inspired by Custom legend Harry Westergard. When Thom finally found the 33 Cabriolet in 1973, that was rust free but hacked up beyond easily going back to stock he couldn’t afford it… After parts were sold off, he was finally able to trade his finished 51 Ford for it… He could envision his new Purple Metalflake Rod racing across the pages of Henry Gregor Felton’s novels in black primer and It didn’t matter if no one else understood – the car would go back to the way it had originally been built. 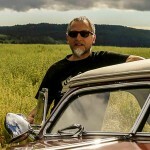 A Cabriolet was a want-a-be roadster in the late forties/fifties… to save embarrassment of a baby carriage top plus weight- the previous owner had discarded the windows and capped and leaded the doors & tossed the top… Repro & original assembly were way out of my price range… So Thom bought a 33/34 Sedan for $50 just to be able to create a new removable top from it… Thom melted out all the lead that had been used to make the body look more like a roadster. 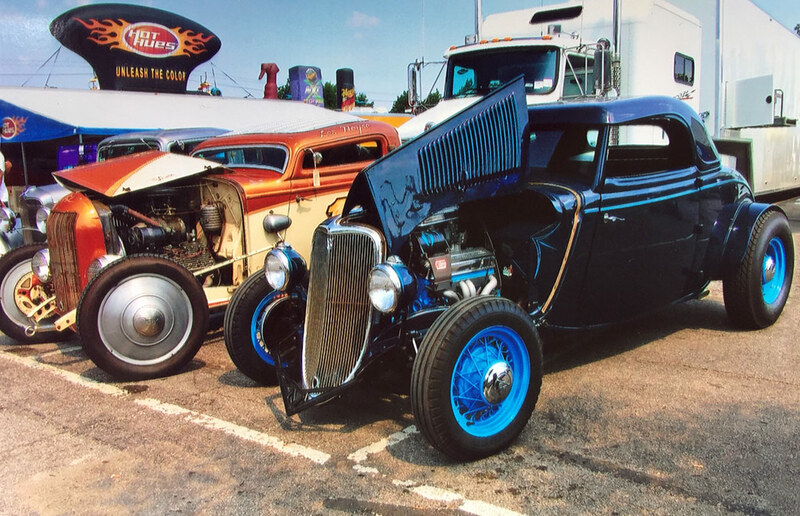 During the stripped the body Thom found out that the car had been purple metalflake and it was painted red, yellow, blue, & black (they didn’t strip the jams)… Plus it had a black roll & pleat interior with padded dash. 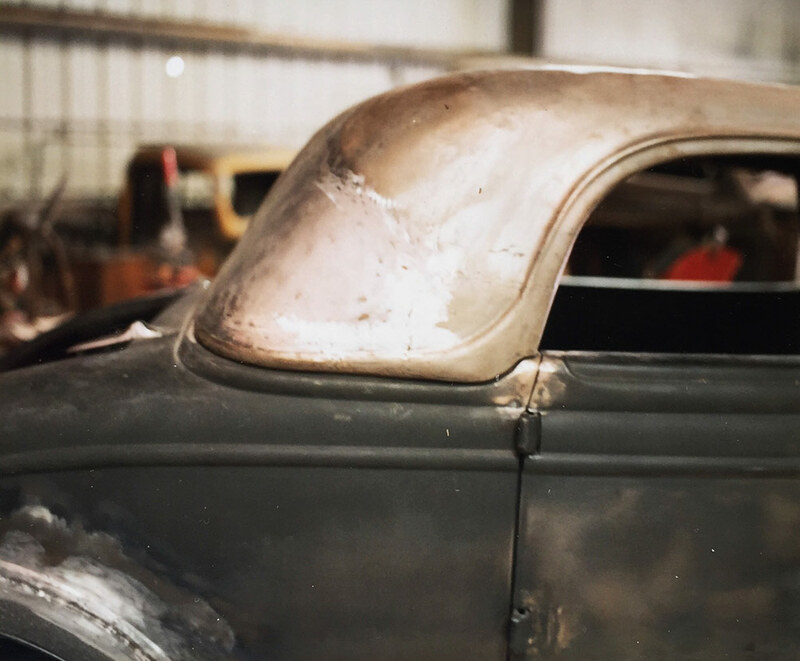 Just two of the many sections cut from the 33 Sedan top that would end up creating the Harry Westergard inspired removable hard-top. 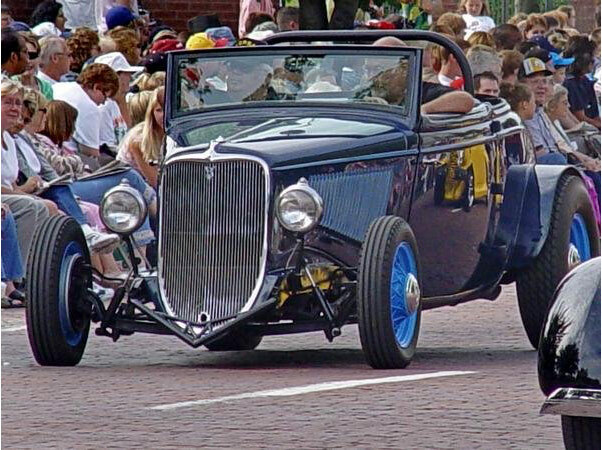 When Thom removed all the chassis components he noticed that whole frame was twisted, the torque side was three inches higher than the other side. 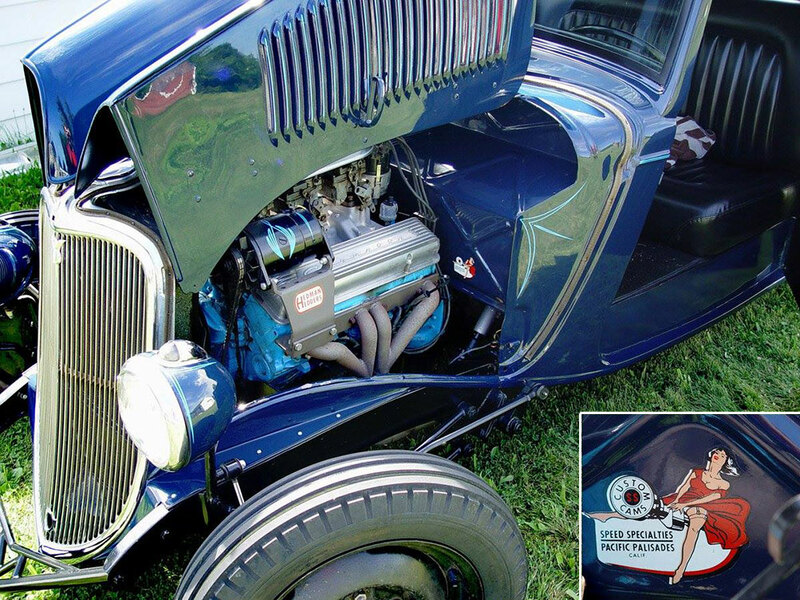 To fix this problem he located stock ’33 cross members and a stock rear end, ’39 toploader with Zephyr gears. These parts were taken to Bill’s Rod & Custom and combined with reproduction Worthington rails on their jig. The front of the Sedan top was heavily reshaped to fit with the new Hard-Top. 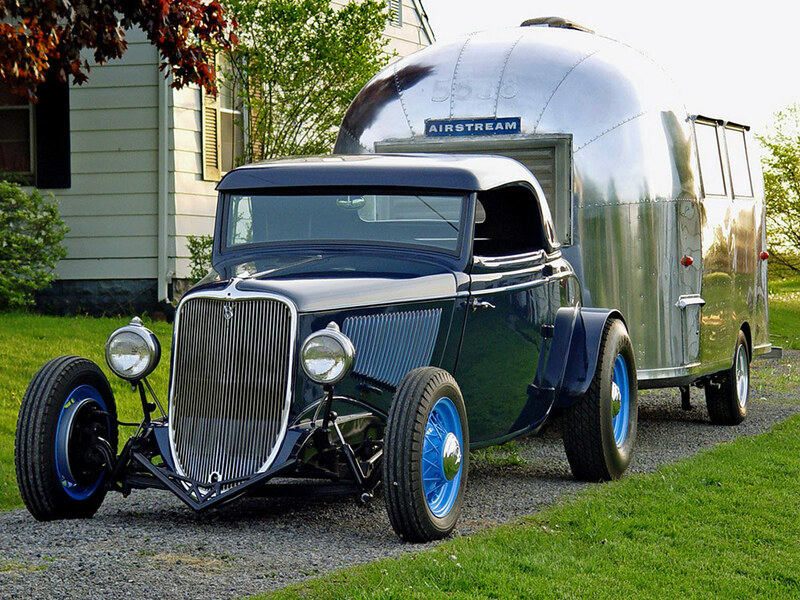 The initial build was done by 78 but Thom and his friends who had helped him out, lacked the talent to do the custom metalwork required for the rest of Thom’s plans… After not finding anyone up to the challenge by the mid 80’s, Thom decided to trade or sell the project and just move on… The first person to look at the For Sale project was Harold Duffey… when I showed him the sedan roof I had found during the hunt for ’33 Ford parts, he stated he always wanted to do a Westergard Style removable hardtop… So the project started its second phase..
Metal top is all welded and ready to be fine tuned. The top of the door line, above the belt-line was slightly angled forward to match the new forward rake of the B-pillar of the Hard-Top. 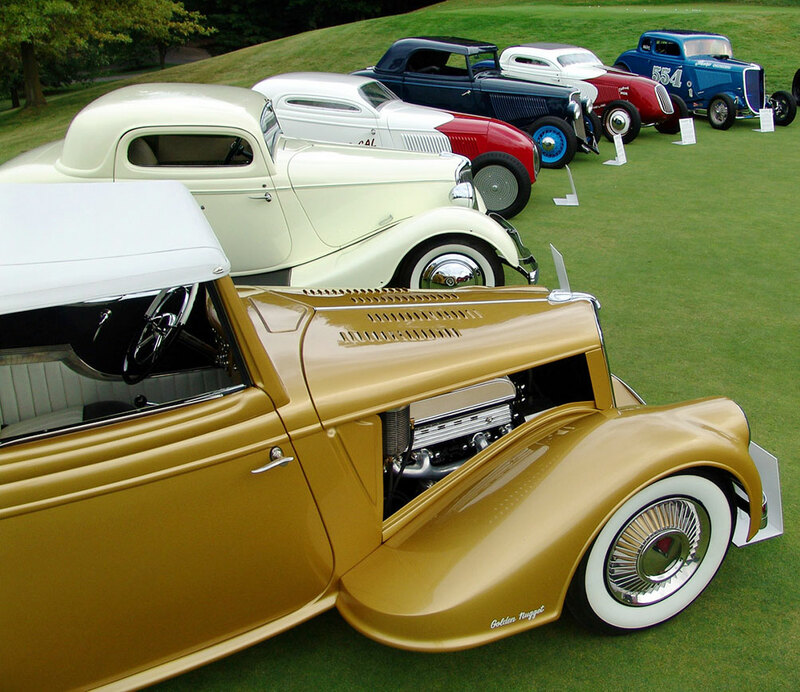 Ohio’s fender law/ enforcement led to 55 gallon drums being re-purposed as rear fenders when the car was originally built. Thom kept them on the car. 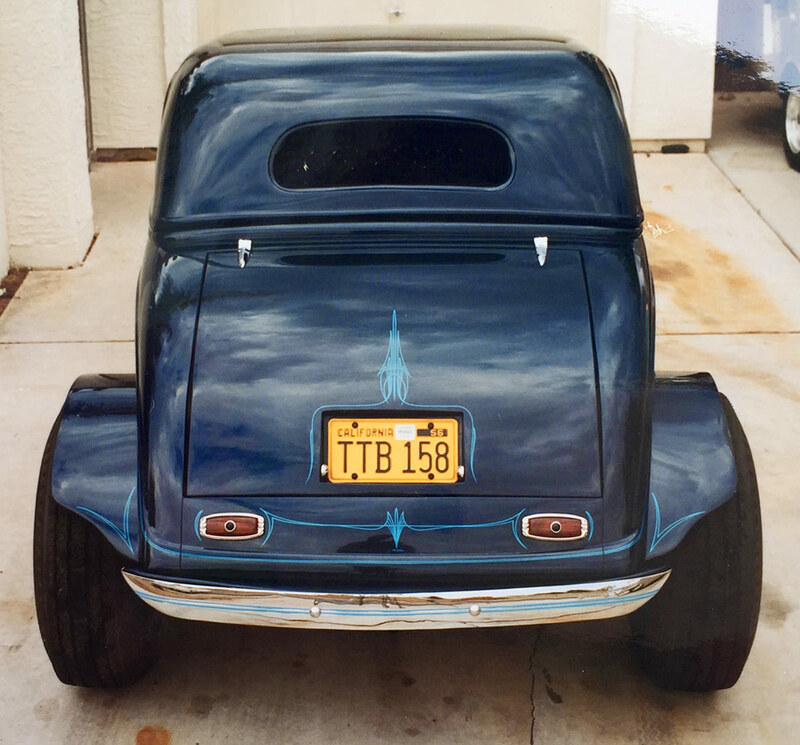 The deck lid originally had 49 Ford hinges when Thom acquired the car, they were retained. Taking the project outdoor for an overall look, and see if all the proportions were as intended… Yes. 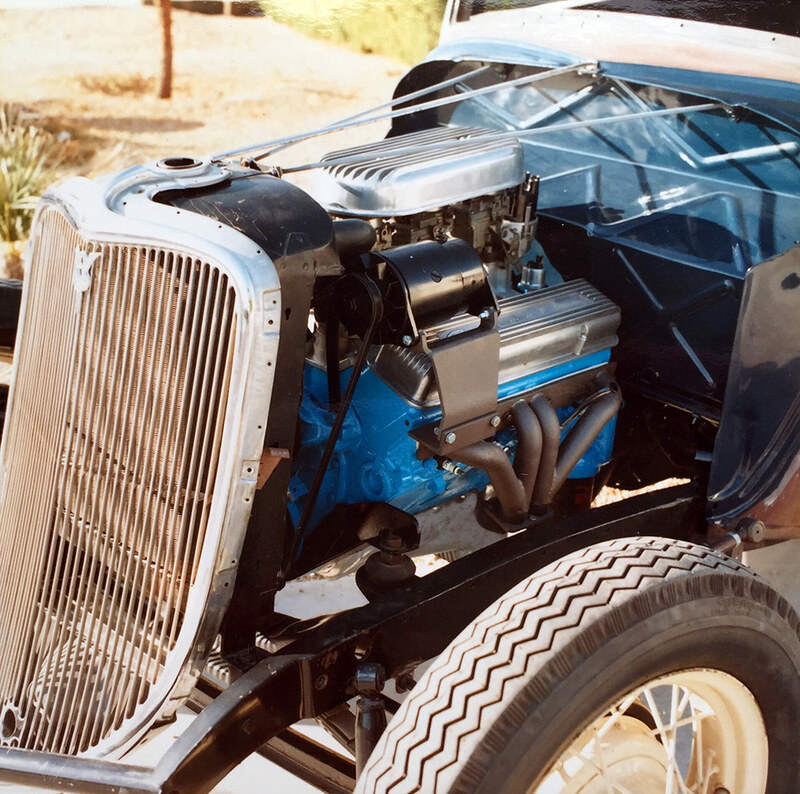 Harold was influential to maintaining early custom touches, he added the sunken license plate, filled the cowl vent, shortened & flipped the 36 commercial rear bumper, redid the quarter panel lines, and adding a 2” lip to the firewall to allow it to be inset back further in the cowl to clear the motor setback while appearing stock-ish. 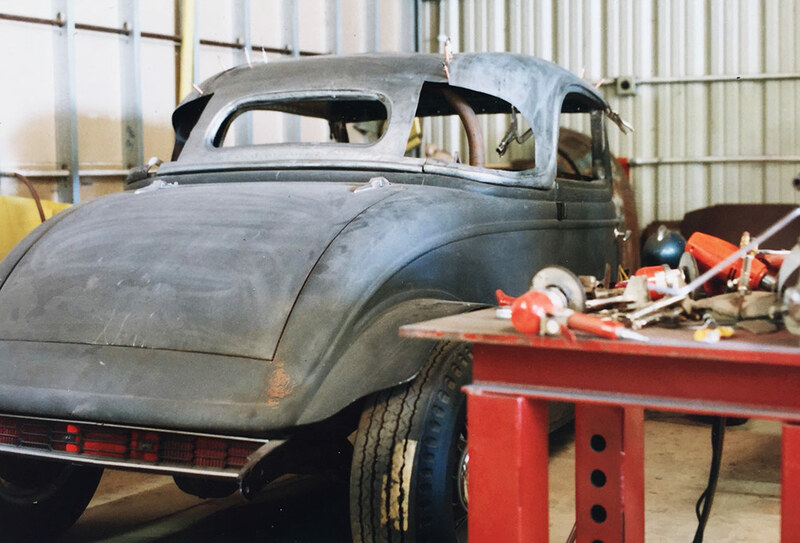 The Sedan roof was cut up to create the base for the new Westergard style Hard Top. 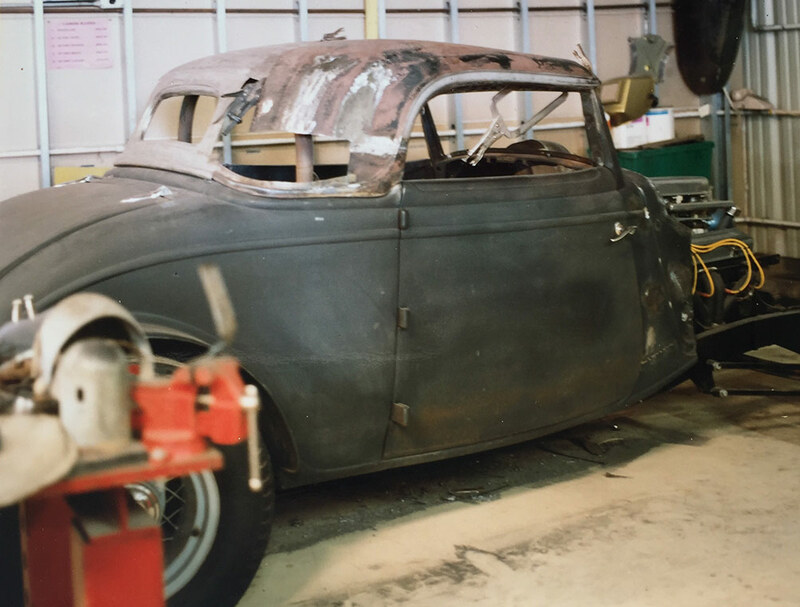 In the mock up stage it became evident that to create more attractive Coupe proportions the windshield would have to be chopped to be able to create side window openings that had similar proportions as the framed frames on a Coupe. 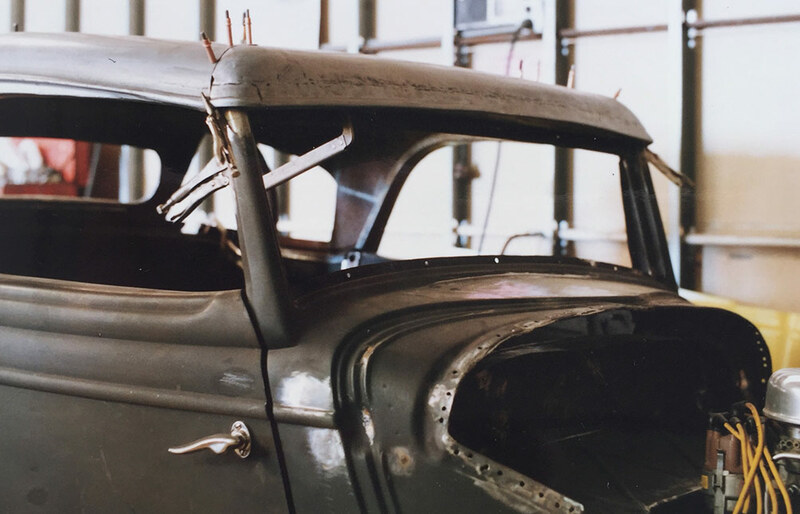 1.5 inches were removed with the windshield posts, and the rear portion of the sedan top was cut down until it fitted the windshield perfect. The sedan reveal and contour of the rear side window opening remained, but were laid forward to create a more elegant feel. 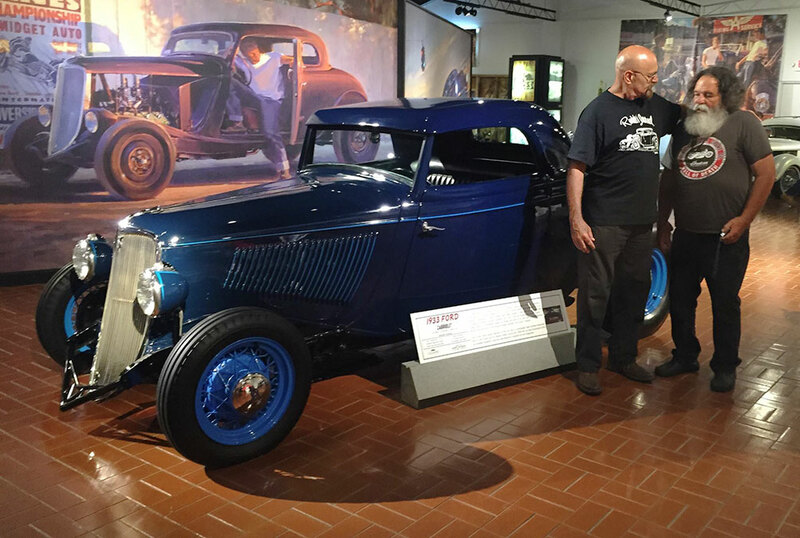 The rear window of the Sedan was also used, but was chopped and narrowed to more of the ’32 Ford proportions. With an additional thirty pieces of metal and four 57 Bird latches – Thom now had rain protection. 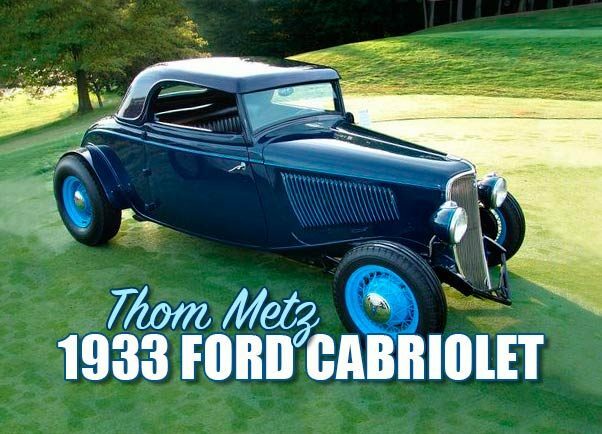 Something that isn’t apparent when looking at the car – firewall is inset 2” into the cowl to utilize stock hood… early channeled cars (like Thom’s) typically ran a ’32 vertical shell. Unfortunately, Harold’s health deteriorated and he could not continue to help out on the project. 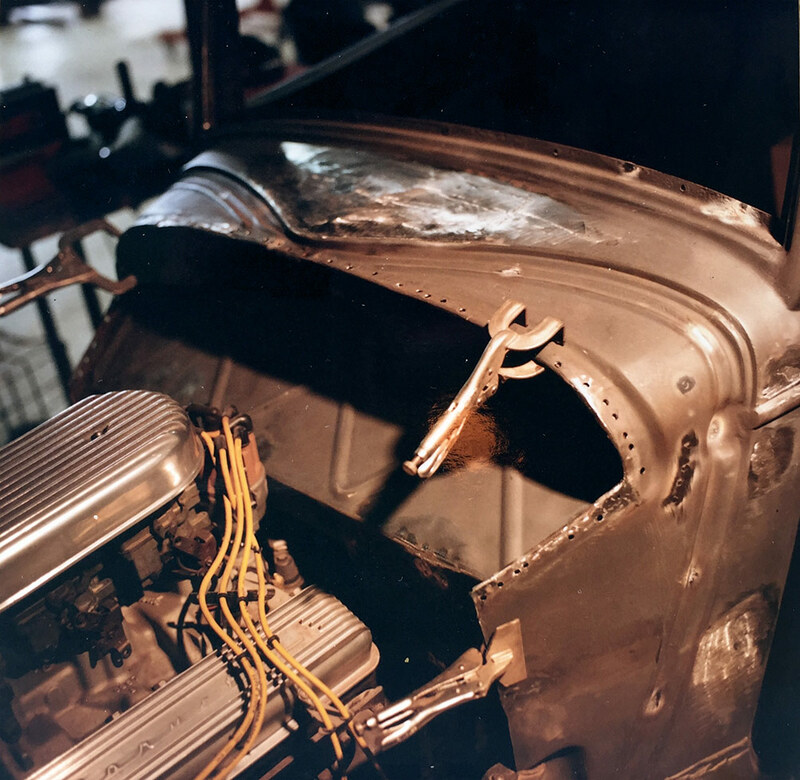 Thom then got the helping hand of Frank Borowicz who ended up hand-forming the lower hood support to frame panels. 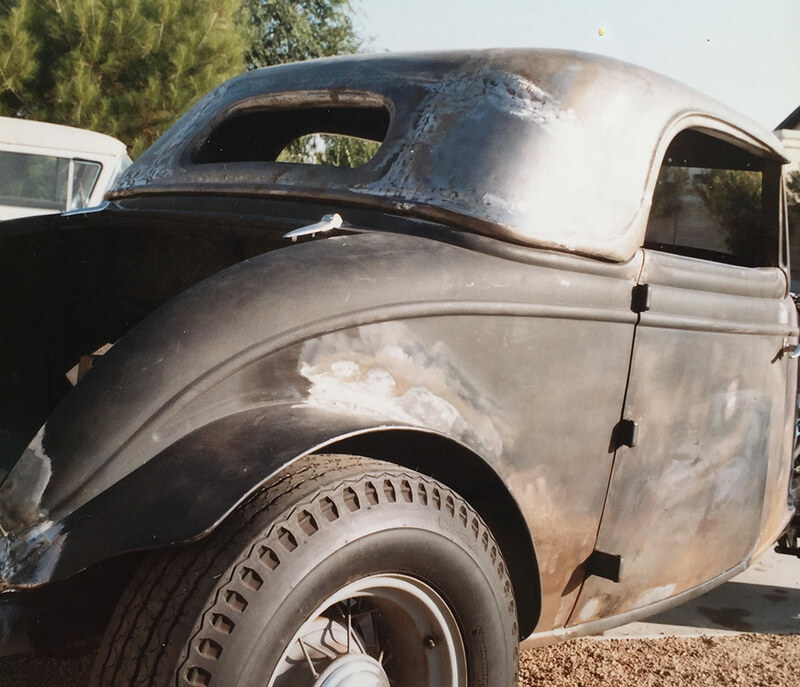 One item on Thom’s bucket list was having the ’33 in LARS… well the no primer requirement forced him into actually painting the car to meet the criteria for the show. 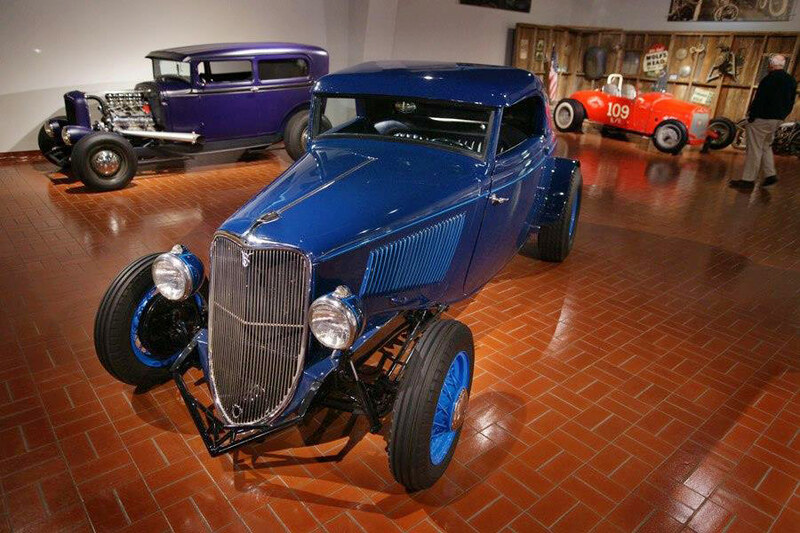 Thom chose a beautiful Washington Blue for the paint, a color that suited the car perfect and gave the car a even more classic appearance. 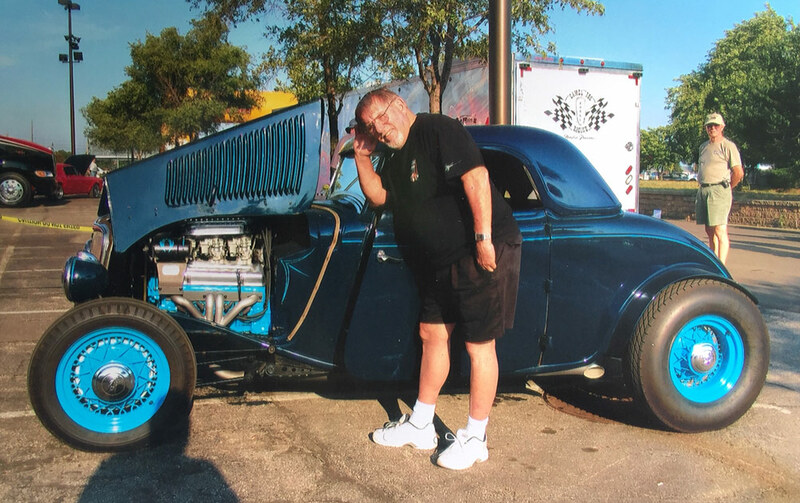 The 1×2” sub frame is insulated sandwiched between floor and louvered lower panels… Thom also mentioned that the car is pretty roomy inside – Thom is 6’ and he can stretch out his legs… plus the black leather vintage style upholstered seat can be lowered.. 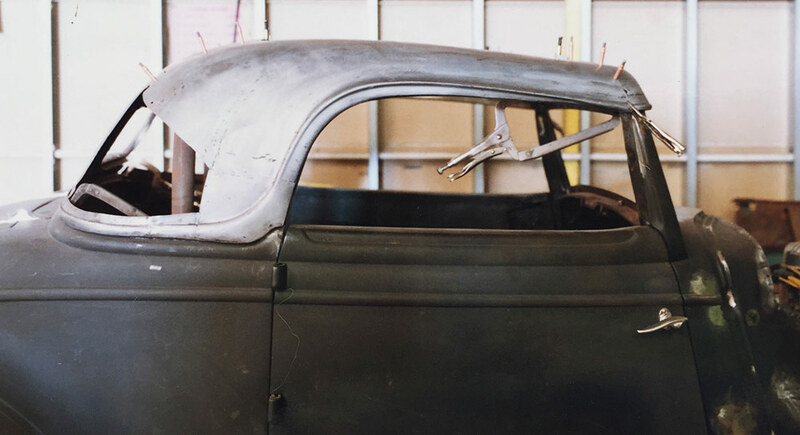 Comparing the finished chopped and narrowed rear window opening with the stock ’33-34 Ford rear window. 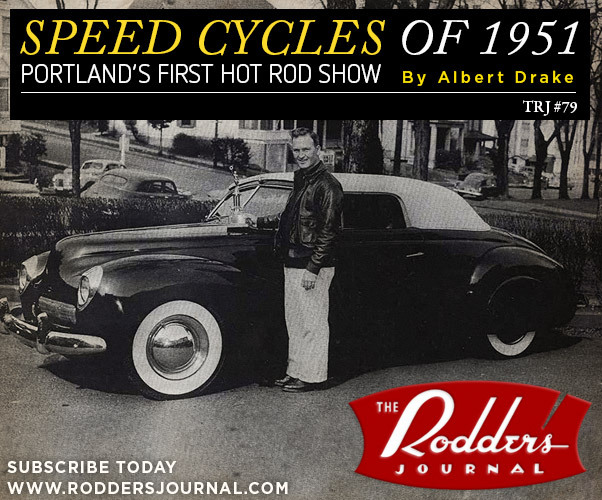 The aftermarket “Hot Rod” headlights were introduced in 58 and didn’t sell well because junkyard one were a lot cheaper… they are smaller than Guide’s and production units. 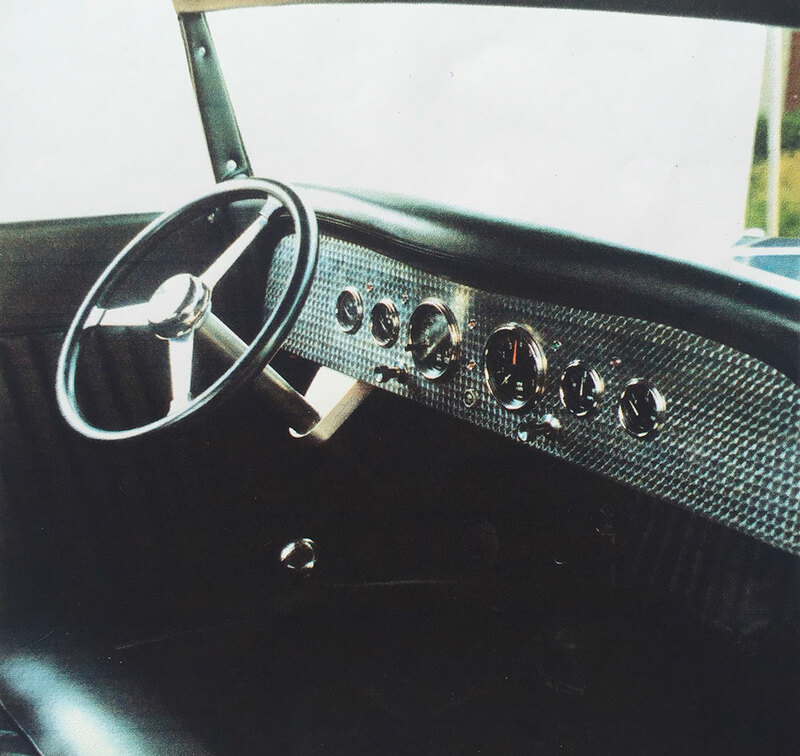 The hood sides were modified and part hand made by Frank Borowicz. Attention to detail and fit-finish is immaculate. 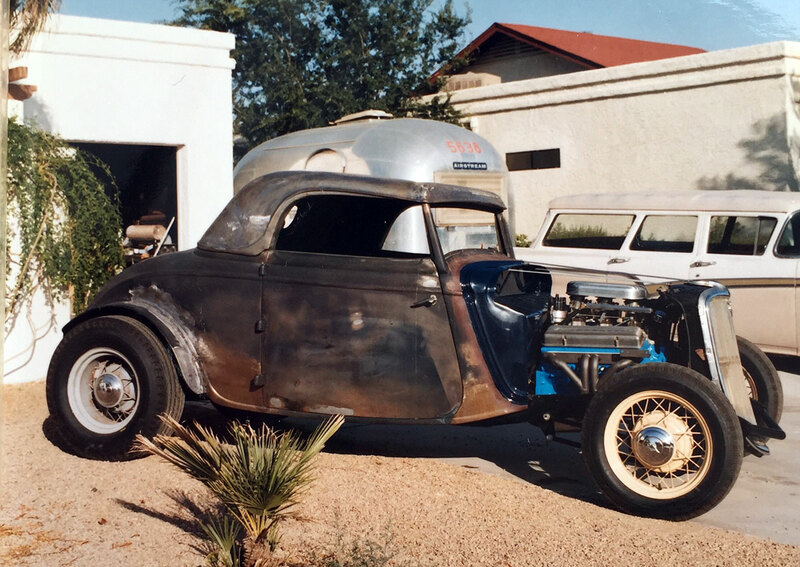 During the course of the build Thom stopped by Butch Tucker’s shop in AZ many times. He kept mentioning that he wanted a “Von Dutch” stripe job when his ’33 was done… He thought it was a simple request since he had Dutch’s original flying eyeball sign in his shop- he must know his work… Thom mentioned it to someone and told me that was an insult to an artist to ask them to copy another artists style (especially since Butch was well know for his own style)… He never mentioned it again… a couple of years later Thom brought the Washington Blue finished ’33 into Butch’s shop for some striping… as Thom started telling Butch what he wanted done – Butch abruptly stopped him & asked “didn’t you want a Von Dutch stripe job?” Thom nodded yes and Butch explained that he could watch if he kept his mouth shut or he had a perfectly good waiting room… then to Thom’s dismay he signed it Von Butchr! The rear bumper is a shortened & flipped the 36 commercial rear bumper, taillights are 48 Chevy units. 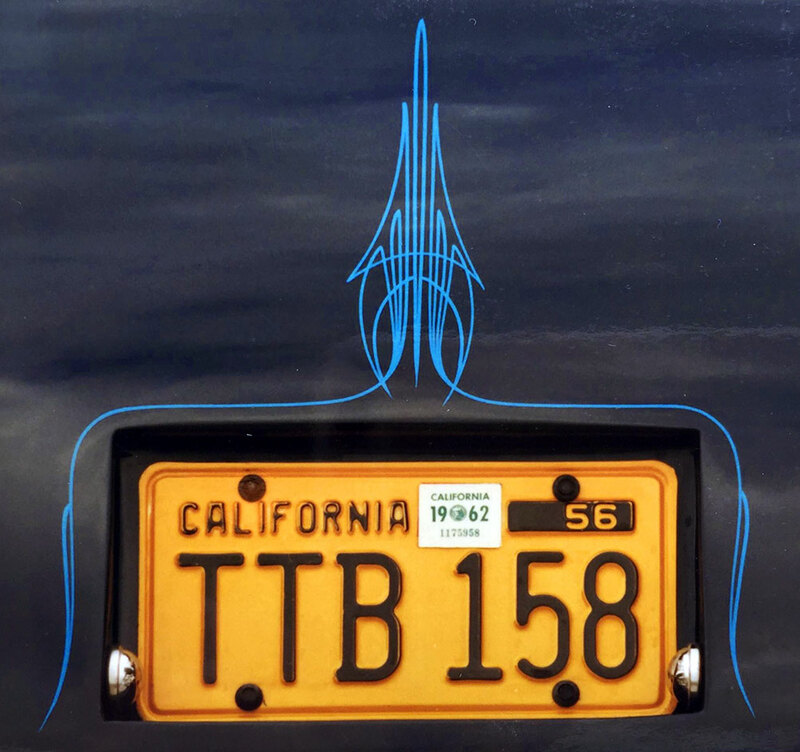 Close up of some of Butch Tucker’s beautiful Von Dutch style striping and the recessed license plate created by Harold Duffey. Made it to LARS, and looking good. 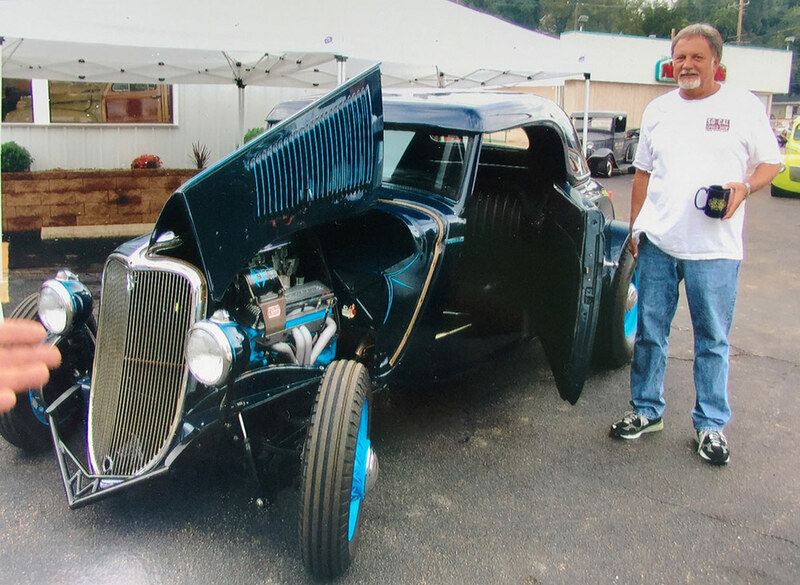 Pete of Pete & Jakes with Thom’s Ford at the Pleasanton show. 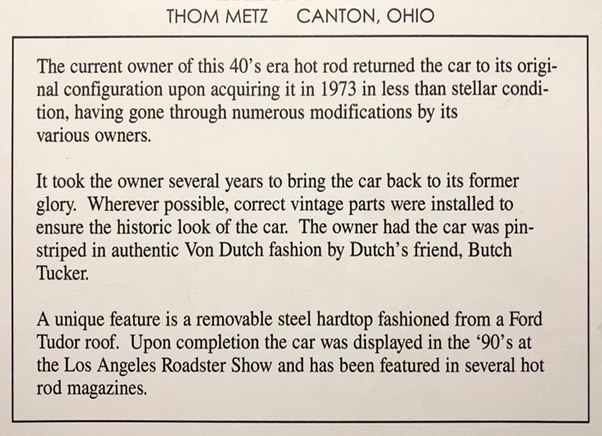 Pete & Jake had inspired Thom to build the car as it was found and not build it as a Resto Rod which was the mainstream trend at that time Thom created it. 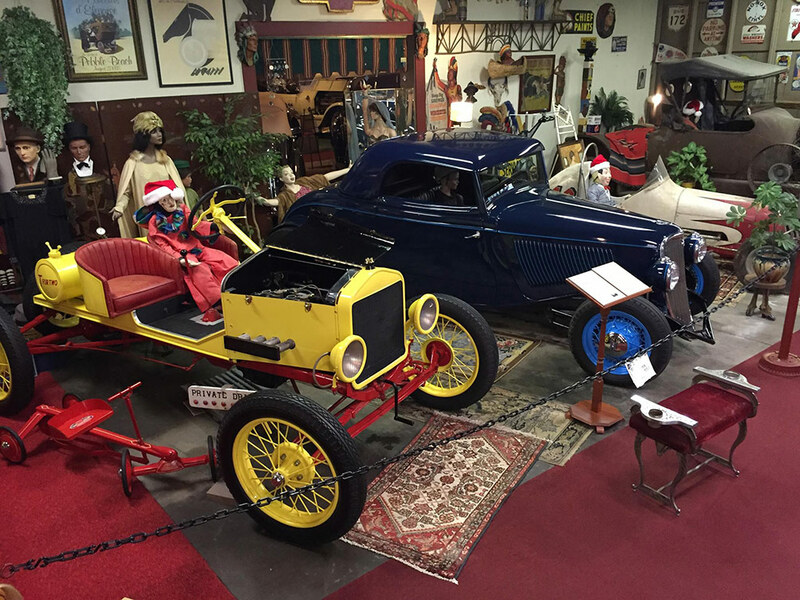 Looking good at the Gilmore Museum. 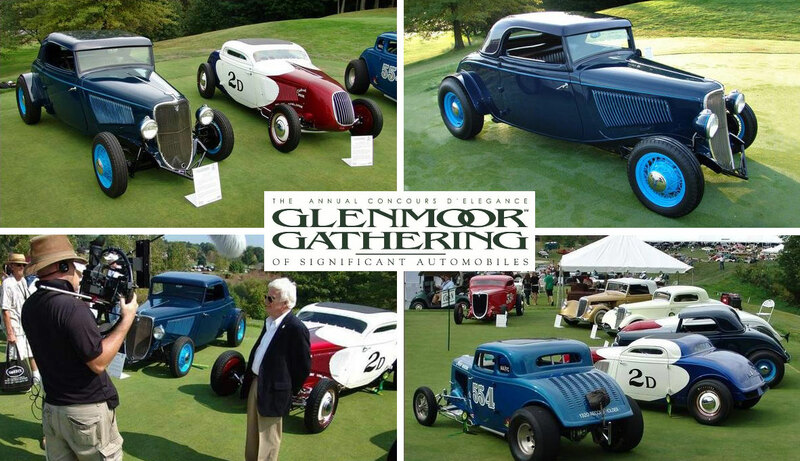 The Ford is now on load to the Canton Classics Car Museum… where it has been for almost three years already.